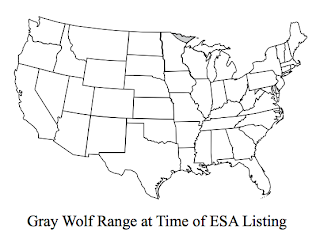 Once the new federal budget, which has already been passed by the House of Representatives, makes it through the Senate and across the President's desk, a familiar animal species will have undergone an identity change: in the western United States, the gray wolf will no longer be endangered. In 1978, on the brink of extinction, the gray wolf was listed as endangered in the lower 48 states. The one exception was in Minnesota, where it was only "threatened." (See that gray spot?) We stopped hunting them and started trying to save them instead. Now that there are about 1,650 wolves living in the western United States, hunters and ranchers would really like to be allowed to shoot them again. 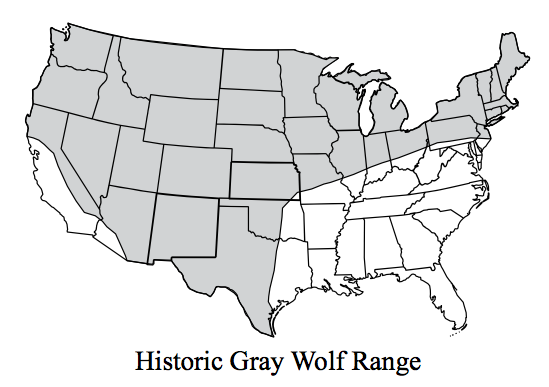 It was 2003 when the Fish and Wildlife Service first tried to "downlist" most gray wolves in the U.S., moving them from the endangered category to merely threatened. This would make it easier for people to legally manage the wolf population. (In this context, "manage" is a nicer way to say "sometimes shoot.") 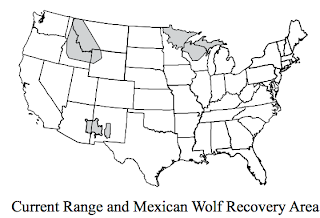 But conservation groups challenged the new rules, arguing that the FWS had jerrymandered the ranges of wolf populations to make them appear healthier than they really were. Federal district courts in Vermont and Oregon overturned the downlisting in 2005, and wolves stayed protected. If this is sounding like an endless legal slog, you've got the right idea. 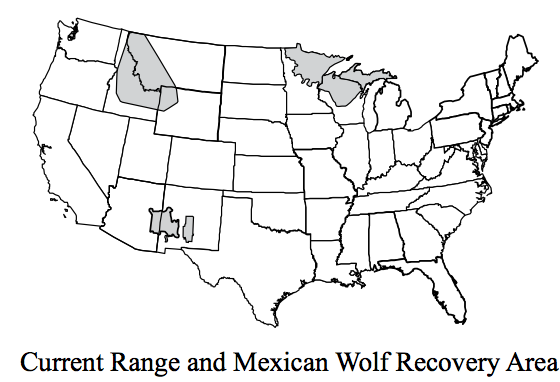 Wolves in the Rocky Mountain region were delisted altogether in 2008, then re-listed in 2010. 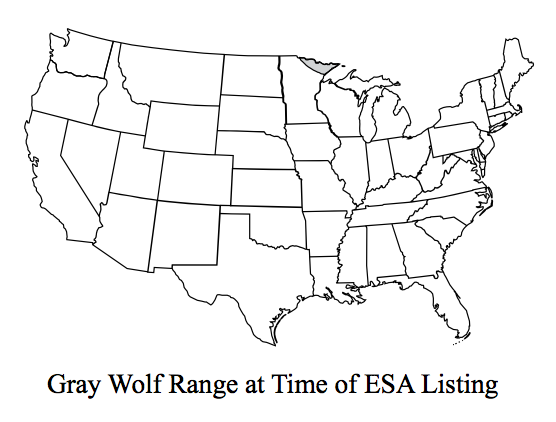 Delisting the wolves would mean turning over their stewardship to the individual states. But while Montana and Idaho had come up with plans to monitor the wolf population and regulate wolf kills, Wyoming couldn't commit to any plan besides killing all wolves on sight. This brings us back to the present day. In a bid to circumvent the ongoing legal struggle--and perhaps to boost his own chances for reelection--Democratic Montana senator Jon Tester attached a gray wolf provision to the new budget. The addendum will "roll back the clock" to 2008 and remove protections on wolves in Montana and Idaho. If the wolves are really recovered, is this a problem? One issue is that the wolves, of course, don't care about state lines, so treating one population as three distinct ones doesn't make sense. Another is that scientific assumptions about how many wolves can be killed without destabilizing the whole population may be unfounded. And though Montana and Idaho claim they'll responsibly manage the wolf population, the governor of Montana recently made it clear that he won't investigate or prosecute any wolf killings. Anywhere livestock are attacked, he said, entire packs of wolves should be destroyed. 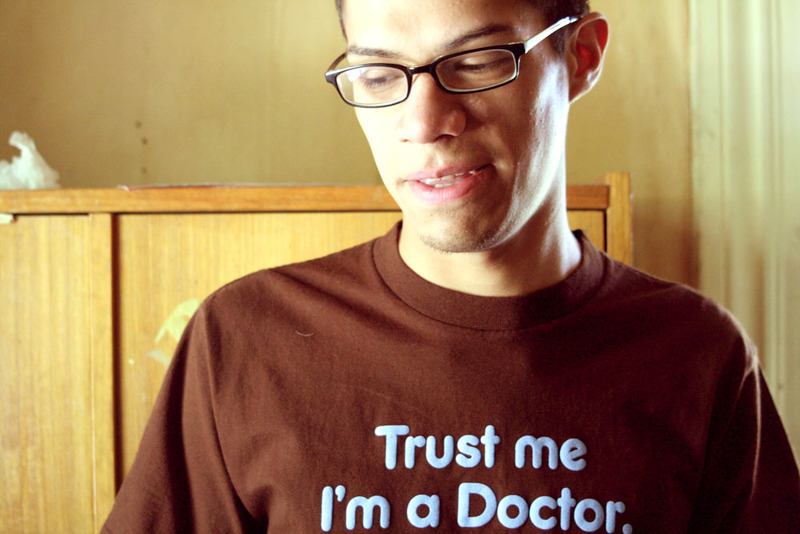 Furthermore, Tester's budget add-on sets a precedent. Never before has Congress intervened to remove a species from the protection of the Endangered Species Act. "Science should dictate which plants and animals will be protected, not the whims of politicians," says Andrew Wetzler of the Natural Resources Defense Council. If other endangered species are in the way of drilling or development projects, will they show up on the congressional agenda? The wolf population in the Rocky Mountains may be safely regulated by the states, finally ending the long legal battle. It also might end up back on the endangered species list--either as a result of further litigation, or because its population is truly, once again, in danger.